another way i’ve been using up my cherry tomatoes… on pizza. sooo good! it’s fun to get creative with pizza and find a new favorite creation! Caroline, thanks for all your great recipes. My tomatoes are just about ripe and I’ve been wondering what I’m going to do with them all. Can’t wait to try some of these dishes out. We missed you at the girls dinner. 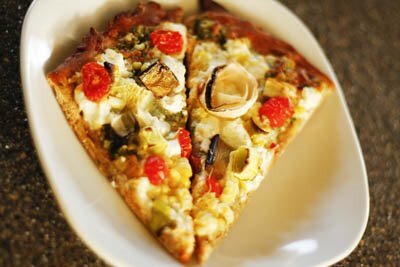 Oh I just realized this is similar to the pizza at P712, yum I love it!